For most False Bay residents, Seal Island is a rocky silhouette 17 kilometres away from the land that only looms into view on crystal clear, calm days. It is a place shrouded in both fascination and abject terror. Its jagged shores are home to 75,000 Cape fur seals and five species of sea birds. It is also the mythical hunting ground of the most dreaded and talked about member of False Bay’s vast ecosystem: the great white shark. For marine biologist Alison Kock, the island has become a scientific holy land. Over the past 12 years she has made hundreds of pilgrimages to its hallowed waters and has dedicated most of her waking hours to learning about great whites in False Bay and examining their relationship with local ocean users. For South Africans her name has become associated with everything shark; Shark Spotters, shark science, shark conservation, shark nets and shark attacks. She had been studying marine biology for three years but had never heard a whisper about great whites breaching. That image electrified a string of questions that would propel the next 15 years of her life. From that very first trip, she became a volunteer on Fallows’ and Lawrence’s boat, and for the next two years she guided tours, washed boats and worked in the office, but a new goal was taking shape. Every day she would go out to sea with a boatload of tourists who were equally amazed by the animals, and with their awe, came curiosity. At the time, there was very little scientific information on South African great whites. Apart from a few statistics based on the number of animals caught by shark nets in KwaZulu-Natal, we did not know how big South Africa’s great white population was and there was not a shred of research about their behaviour. ‘I just realised that we knew nothing about these sharks. There was no literature. The clients continually asked us questions and we just couldn’t give them any answers,’ Kock remembers. The impressive teeth of the great white shark. 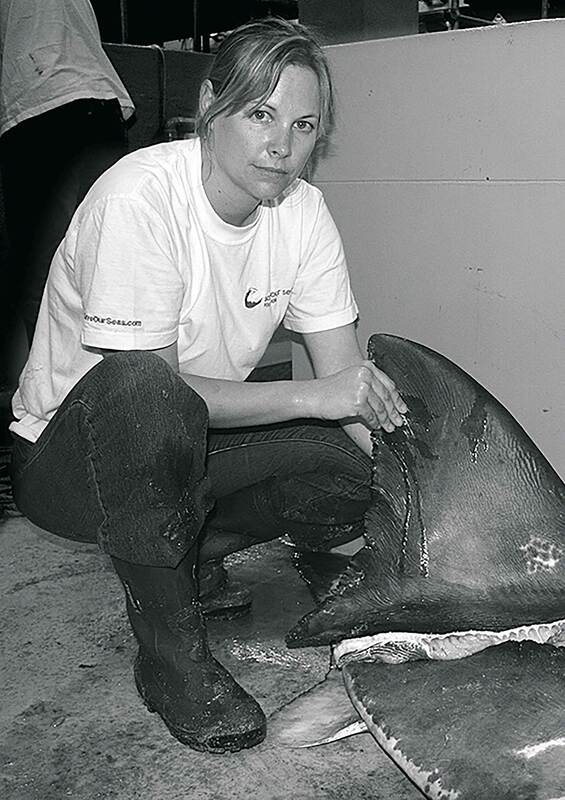 In 2003, after completing her Honours degree, she enrolled for a Masters under the supervision of Leonard Compagno, one of the foremost shark experts at the time. Compagno was the scientist who helped to design the mechanical shark used in the filming of Jaws, but more importantly it was his lobbying that led to the incredibly progressive conservation policies that have protected great whites in South African waters. In 1991, under Compagno’s guidance, the government showed admirable foresight by becoming the first country to ban the commercial hunting of these sharks. They knew the population was vulnerable because of slow reproduction rates and the global demand for their jaws. Their actions 22 years ago provided Kock with one of the largest great white populations in the world on which she has been conducting pioneering research for the past 12 years. Undaunted by the controversial, her first study focused on shark behaviour around Seal Island and together with her Canadian research partner, Karl Laroche, they looked at the implications of shark cage diving and chumming. The chumming of sharks for viewing purposes is prohibited in the USA, but South Africa has built up a highly profitable industry that is reliant on attracting great whites to boats by chumming them to the surface. 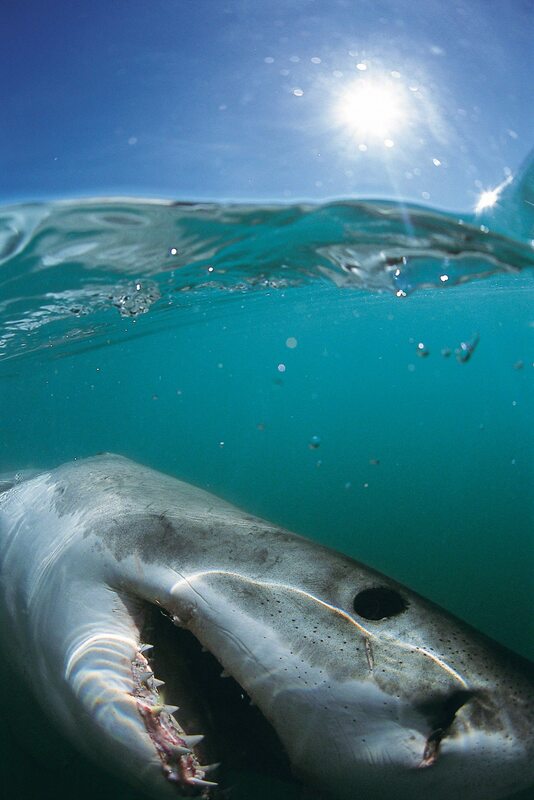 The first cage shark diving operations started in Gansbaai in 1991, following their new protected status. At the time of the ban, operators who had originally made an income by hosting sport fishing trips to catch great whites turned to cage diving. At first the industry focused on adventurers and filmmakers, but in 1996 an operation started in False Bay and the industry grew increasingly accessible to the general pubic. At first Kock struggled to find sponsorship. She approached government, NGOs and the private sector, but funding was limited and for the first year she conducted research from her father’s small fishing boat. Fortunately, the founder of the Save Our Seas Foundation (SOSF) has a passion for white sharks and often came to dive with them. On one trip, during the early days of establishing the SOSF, they interviewed Compagno, who suggested that Kock apply to them for funding. She emailed the foundation, but at first support was not forthcoming. ‘I sent about 15 emails before I got a reply. I was kind of persistent,’ she reflects. Finally, in mid 2003, Kock’s research became one of the first six projects supported by the SOSF. They supplied her with funding for general running costs, a new research boat and acoustic tags and receivers to implement what was at the time the largest acoustic array for tracking great whites in South Africa. One of the hypotheses Kock and her co-workers had was that chumming changed the behaviour of great whites. Surprisingly, and to the indignation of many anti-shark cage diving lobbyists, Kock found that the meager offerings that were being tipped into the sea could not compete with a shark’s preferred prey: ‘Unless you’re going out there and providing what is equal to or better than what the seals provide, you probably aren’t going to have a long-term impact on them. Essentially, our theory was totally wrong, as science goes,’ she laughs. 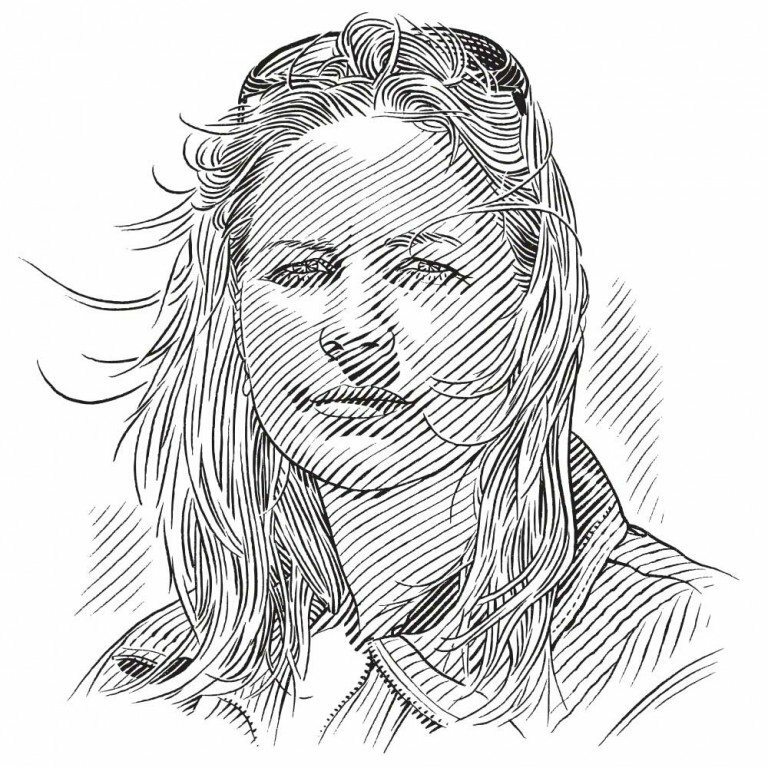 Ten years into her career, after thousands of trips across the constantly fluctuating expanse of False Bay, Kock is starting to paint a fairly comprehensive picture of what great whites are up to above and below the surface. She has tagged more than 80 white sharks (as well as 17 sevengill cowsharks), burnt thousands of litres of boat fuel and deployed dozens of acoustic receivers. Her PhD thesis analysed half a million data points collected between Cape Point and Hangklip. Marine biologist Alison Kock holds the fin of a great white shark. In 2008, she took on an even bigger role with regards to the shark/human interface, that of chief scientist for the Shark Spotters – an ocean safety organisation that aims to protect ocean users from sharks by warning them when the animals are in the area. All along False Bay and the Cape Peninsula, shark spotters are stationed on the mountainside, wearing polarised sunglasses and scanning for sharks. Beachgoers are warned with a siren and a number of colour-coded flags signifying the likelihood of incidents according to conditions such as visibility. 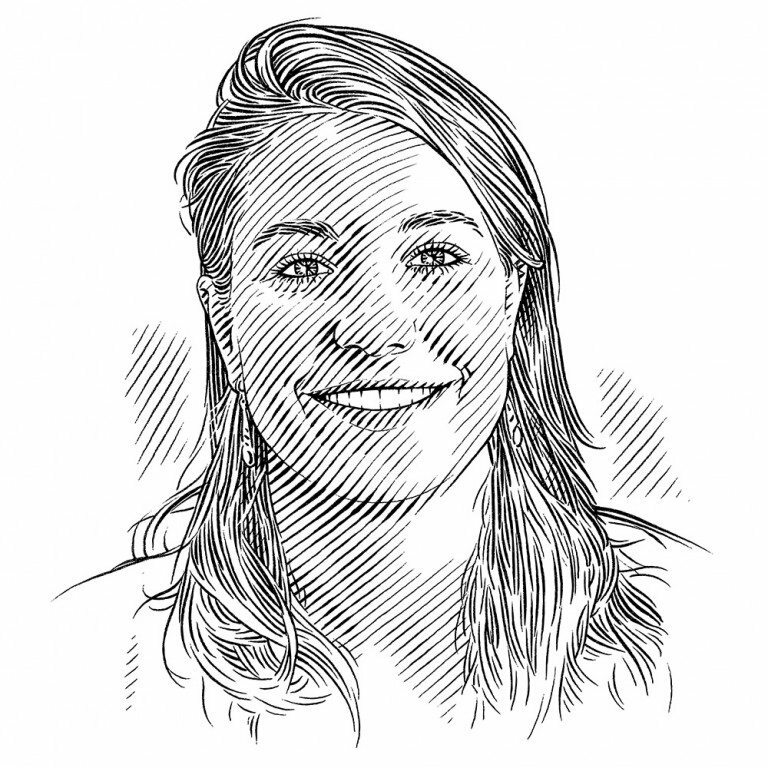 After five years at Shark Spotters she has found that it is vitally important to balance the concerns and safety of ocean users with the advocacy of sharks: ‘It can’t be one or the other, it needs to be both for conservation to work’. Shark Spotters is a conservation organisation, but rather than aggressively campaigning for sharks, Kock believes in a subtly informative approach that allows people to share in her fascination with the animals whilst arming them with the facts they need to take personal responsibility and mitigate risks. Before entering the water, ocean users should be observant and make an assessment. ‘I don’t think you’re ever going to convert everyone to start loving sharks, but I do think you can turn that fear into respect and acceptance,’ she comments.